Rep. Carlos Curbelo (R-Fla.) is preparing to introduce legislation that would pause federal regulations on climate change in exchange for an escalating tax on carbon emissions, according to draft legislation obtained by E&E News. The move, which comes as Curbelo defends his congressional seat in South Florida, is a rare effort by a Republican to address global temperature increases by reducing greenhouse gases. It's also causing strife within his party. Curbelo is trying to line up co-sponsors before the legislation's public release next week, but GOP opponents are already targeting it as anathema to Republican principles on economic growth. The House Rules Committee is meeting today on whether to allow a vote on a resolution that calls carbon taxes "detrimental" to the economy (Climatewire, July 16). In an interview yesterday, Curbelo wouldn't go into detail about the bill, saying only that it involves "regulatory reform" and that it would make investments in infrastructure and adaptation. "It really attempts to capture the political energy of the moment," he said. "We know that infrastructure investment is highly popular in our country. It's probably the only issue that [President] Trump and [Democratic nominee Hillary] Clinton agreed on in 2016." A copy of the draft bill obtained by E&E News calls for eliminating the federal gas tax and replacing it with a $23-per-ton tax on carbon emissions from oil refineries, gas processing plants and coal mine mouths beginning in 2020. Industrial sectors such as cement, aluminum, steel and glass would also pay the fee for emissions stemming from physical or chemical reactions outside of energy production. Sources said Curbelo's office was shopping that version of the bill last week. Modeling, which the draft text notes is "still under development," suggests the plan would reduce fossil fuel emissions 24 percent below 2005 levels in 2020, and 30 percent below 2005 levels in 2032. For comparison, former President Obama's target under the Paris climate accord was 26 to 28 percent below 2005 levels by 2025. President Trump has said the United States will withdraw from the climate pact. The draft bill attempts to strike a compromise between environmental and Democratic advocates of greenhouse gas reduction policies and a growing number of center-right organizations that promote a carbon tax as a conservative solution to climate change. It would halt — but not kill — EPA regulations on greenhouse gas emissions so long as the tax meets its goals to cut carbon emissions. The draft legislation contains check-in points in 2025 and 2029 to consider reinstating regulations if the tax hasn't curbed enough greenhouse gases. The moratorium would sunset after 2033 if emissions goals are met. That provision is meant to address concerns from Democrats and environmental groups, which generally oppose forfeiting EPA's authority to regulate carbon in exchange for a carbon tax. Carbon price advocates contend it offers more certainty to industry. Many businesses that don't currently face climate regulations expect that a future administration might craft rules that apply to their sectors. Center-right carbon tax proponents have seen the policy as a way out of that scenario. "While we always need to see the details of a specific proposal, what we do know is that a carbon price is the most efficient way to reduce greenhouse gas emissions by letting members of the private sector to decide when, where and how to reduce their own emissions," said Joseph Majkut, climate policy director for the libertarian Niskanen Center. The bill is still in draft form, so its contents may change, sources said. The legislation sidesteps a key tenet of libertarian and free-market groups that are trying to drum up support for the idea — it's not revenue-neutral. The draft uses revenue to pay for other federal spending priorities, such as shoring up the depleted Highway Trust Fund, state grants for low-income families to offset higher energy costs, research and development programs, and financing coastal restoration projects. "This tosses all of those justifications out the window," said Kenny Stein, policy director with the Institute for Energy Research. "I don't know how any of those groups could support this." The draft bill does accomplish a goal of center-right groups by eliminating a tax — a so-called tax swap. But critics note this isn't a one-for-one offset, because it would increase revenue for the federal government. It's designed to fix the flagging gas tax, which has failed to keep up with highway repairs as vehicle efficiency has increased, motorists drive fewer miles and more people move to urban settings. "Revenue neutrality has not been demonstrated to be the carrot for politicians like many people thought it would be," Majkut said. The draft also says the tax should be "border adjustable," meaning fees could be assessed on imported products from countries without a carbon tax. 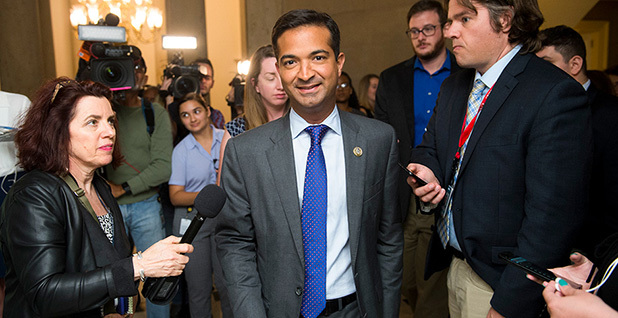 Curbelo, who co-chairs the bipartisan Climate Solutions Caucus, is facing a tough re-election battle in South Florida. He has made climate change and bipartisanship key parts of his message. The legislation would face long odds in the GOP-controlled Congress. Stein said that the draft's automatic tax increase "puts the fee on autopilot." "I don't see how anybody on the right can justify that," he said. The bill doesn't have a Senate companion yet, Curbelo said, but he predicted it would "get people's attention." "This bill, we've put months and months into it and have taken it around to a lot of experts and groups and corporations. We have high hopes for it," Curbelo said. "That doesn't mean it gets passed this Congress, but it means we really think it could be a good base for bipartisan cooperation on this issue." Greg Bertelsen, senior vice president with the Climate Leadership Council, an organization that includes former Republican administration officials, environmental groups and oil and gas companies, said he "likes the direction" of Curbelo's draft legislation. CLC has pushed a carbon tax that would return revenues to taxpayers in the form of dividends, while nixing greenhouse gas regulations. "The council's view has always been that this is going to be a longer-term play and like any major policy issue," Bertelsen said. "It can take more than one Congress to build the level of support and education for overall passage, but it's pretty clear that the public wants both parties to come together."